Virtual Group has deliberately set itself up to be different. Virtual Group has deliberately set itself up to be different. Don't believe us? Where the company was set up with 50 shares and each consultant owns one? Where are no buildings and almost no overheads? Where there are 'no managers? Where there are no juniors? Where there are only 3 rules? Where nearly all the consultants come from a background of being operating managers rather than consultants? Any one of these would make us different. All of them make us unique. 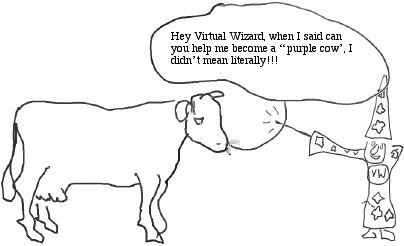 Back in 1995 when we launched Virtual in a pinstriped tent, none of us knew the term purple cow but we intuitively knew about the concept. We have deliberately positioned ourselves to appeal only to the most progressive and open minded managers. We know we will not appeal to the others. This is okay because it allows us to accept just the most innovative and challenging projects. We will not give you boring. We will not give you formulas. We will not give you juniors that learn while you pay.